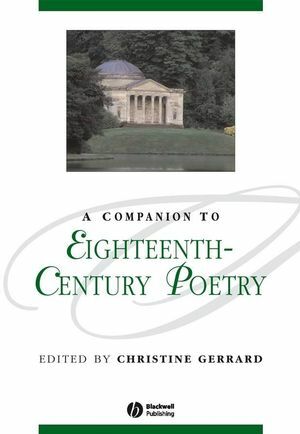 This broad-ranging Companion offers readers a thorough grounding in both the background and the substance of eighteenth-century poetry in all its rich variety. Includes more provocative contributions on subjects such as rural poetry and the self-taught tradition, British poetry 'beyond the borders', the constructions of femininity, women as writers and women as readers. Christine Gerrard is Fellow and Tutor in English at Lady Margaret Hall, Oxford University. She is the author of The Patriot Opposition to Walpole: Politics, Poetry, and National Myth, 1725–1742 (1994) and Aaron Hill: The Muses' Projector, 1685–1750 (2003). She is the co-editor, with David Fairer, of Eighteenth-Century Poetry: An Annotated Anthology (Blackwell, second edition, 2003). Brings together original contributions by leading international scholars and practising poets. Offers critical and contextual coverage of the full range of English-language poetry in the twentieth-century. Incorporates new readings of key selected texts. Embraces the extraordinary development of poetry over the century in twenty English-speaking countries. Fully integrates women poets, feminist approaches and post-colonial poets.